Daredevil comic books, published by Marvel comic books, feature the exploits of Matt Murdock. After an accident as a youth, he loses his sight and all of his other senses become enhanced. Some early issues of this title were reprinted in "Marvel Super-Heroes (1967 series)" and "Marvel Adventures Starring Daredevil". We have 243 of the 380 issues. "While the City Sleeps!". First appearance of Ape Man I (Gordon Monk Keefer). Frog-Man I (Francois LeBlanc), Animen, Cat-Man I (Townshend Horgan), Bird-Man I (Henry Hawk), Ape Man I (Gordan "Monk" Keefer). "There Shall Be a Gladiator". The first set of Daredevil comic books (issue #1 is dated 1964) is the most popular among Daredevil fans and collectors. But other Daredevil comic books for sale are nearly as popular. Some Daredevil comic book series contain just a few issues (like Daredevil: The Man Without Fear) and others are longer, such as Daredevil (1998 series). All our Daredevil comics for sale come with a complete money-back guarantee. As a result, if you're a Daredevil fan and looking for Daredevil comics for sale, look no further! 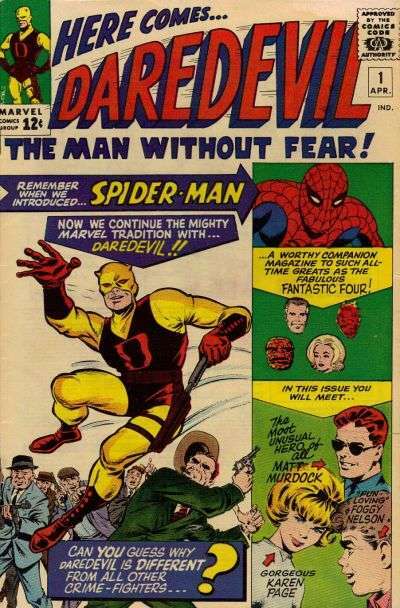 Before there was a 'Persons with Disability' law in the United States, before the blind were called "vision impaired" and in a time when such persons were sometimes ostracized and shunned, Stan Lee created Daredevil. Coming off his successes with the Fantastic Four, Spider-Man, the Avengers and the X-Men, Lee really hit a homerun with his newest superhero. The story is a basic theme of literature throughout the ages - someome overcoming great odds to achieve and succeed. In Matt Murdock's case, an accident blinds him, but enhances all his other senses, smell, hearing, etc. So, rather than bemoan his sightless state, he rises above the adversity to achieve incredible success. Now, I have no idea whether Daredevil had any sort of impact on sightless individuals, but many people have some sort of disability, whether it's a physical, psychological or emotional. I have to believe that Daredevil's ongoing popularity (despite a horrible movie starring Ben Affleck) results from readers relating to a person who has to overcome obstacles every day. Think about every book you've read or movie you've seen. In most every one, the protagonist has to overcome incredible odds. So, the genius of Stan Lee is that he created a character where overcoming incredible odds is the norm, day in and day out. And after that, there are the super-villains to contend with. The series is a good one to collect, because in addition to the great stories, the artwork is superior, especially the artwork by Gene Colan. And, since the first issue came after Fantastic Four #1, X-Men #1 and Spider-Man #1, the cost of the series is generally less than that of those series. With only 380 issues (as opposed to 441 for Spider-Man), the series is also easier to collect.